If you don't cook beef stew with either red wine, or an amber or dark beer, than you should. For this stew, I used the St-Ambroise Oatmeal Stout. It gave it a dark deep rich flavour. Cooking with this beer gave it tastes of espresso and chocolate, which gave the stew another dimension. 1. 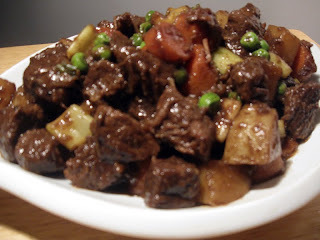 Cut stewing beef into cubes. About 1-2 inches thick. Just make sure they are an even size and will cook at the same rate. Chop vegetables into similar sized pieces and set aside. 2. Dredge the beef in a mixture of flour, salt, and pepper. And heat some oil in a large pot. Once the pot is hot, put in the beef to get a sear on the outside of the beef. Flip around until there is a brown crust forming on all sides of the beef. 3. Next, drop in your potatoes, and pour in your beef stock. This is also when you can pour in your beer, and your vinegar. The vinegar will help break down the beef and make it more tender. I'm not going to put in the other vegetables yet because I don't want those to become overcooked. But I don't mind if the potatoes are mushy. If you want firmer potatoes, put them in with the rest of the vegetables later. Bring to a boil, and then simmer. 4. Simmer the beef in the broth for at least 30 minutes on its own. After 30 minutes, you can add the onions, celery, and carrots to the stew. Also add 1-2 bay leafs. And cover the pot again. 5. Continue to simmer the stew covered for another 30 minutes. At this point you can pull out your bay leafs. And drop in your frozen peas which should cook quite quickly, which is way we save them for last. 6. After a few minutes the beef stew should be done, and ready to serve. Best eaten with bread.